“You Complete Me”… We all remember how we felt when we heard Jerry McGuire make this impassioned declaration. It is a fantasy that so many of us have: That we will find that person who will fill all of the holes in our lives, heal all of our wounds and make us whole. That forever partner who was put on this earth just for us, and without whom, we will be an incomplete being. The unfortunate truth is the concept of anyone completing anyone else is a bunch of BS. If you or your spouse sought out to find someone who would “complete you”, chances are high that you’ll be disappointed with the outcome. The reality is that a marriage has the greatest chance of success when two “whole” people come together to share their lives. If one of you were not whole when you married, or still are not as you sit here today, repairing the marriage without doing some emotional work as individuals may be a hill too tough to climb. Perhaps everything did start out wonderfully, but something changed over the years. It’s hard to put your finger on what happened, or when it happened. You are clear, though, that something did happen. Someone stopped paying attention, stopped caring the way he or she once did. Over the years, it just seemed to slip away. One or both of you disengaged. Have you ever worked at a company that conducts employee engagement surveys? You know the ones… You’re asked to take a survey with a bunch of questions about how you feel about your work, if you have friends there, how likely you are to recommend your place of employment to another. Companies conduct these surveys to get a numerical value on the engagement of their employees. They want to understand this because this is one of the strongest indicators of the employees’ commitment to the company. High engagement means their employees are happy, loyal and have passion for their work. Low engagement means that employees aren’t giving the company their best and are likely to leave. This concept applies to marriage as well. Yet, disengagement is all but impossible to put your finger on. It’s not as tangible or sudden as a lie or an affair. You certainly can’t whip out a quiz for your spouse to take over breakfast to figure out if disengagement lives in your marriage. Disengagement is a near-invisible toxin that leaks into some marriages, slowly killing it over time. What might you find in a disengaged marriage? You try to share something important to you, but he doesn’t really listen or engage in the conversation. She will say shaming or belittling things to you, even in front of your children or friends. He no longer calls while away on business trips to say goodnight. He doesn’t answer your texts while out with the boys. You no longer call each other during the day, just to see how the other person’s day is going. The little touches that show caring for one another have ceased to exist. You feel that your spouse is no longer fighting for the marriage, and you know you aren’t. You co-exist in each other’s lives, rather than connect with each other. You no longer feel seen or heard by your spouse. You feel that your spouse is somehow just checked out. It’s these multiple opportunities to show empathy that you or your spouse were blind to, chose not to see, or just didn’t wish to acknowledge. It triggers feelings of abandonment, unworthiness, shame and being unlovable. At some point, your spouse stopped being your partner, and you became alone in your marriage. This is when you, or both of you, started feeling you were in an unhappy marriage. Your foundation eroded slowly over time. You wonder what happened. You wonder if you’re crazy. Is anything really wrong? Your marriage is fantastic on paper! He does what good husbands are supposed to do. He has a good job, pays the bills, plays with the kids, is good looking, the neighbors love him and the list goes on. She is a great mom, hosts the neighborhood parties, family events, and keeps everything going as it should on the homefront. Most people in your lives believe you are a great couple and “have it all”. The most lethal betrayal to a marriage has happened. You or your partner has disengaged. So, what does this mean to your marriage? This is a very real and valid problem. It’s not “in your head” or unimportant as you may have yourself believing. To get the marriage back on track, you’ll likely need to make much more effort in a way different than anything you’ve previously tried. We offer several suggestions for this in the What Are Some Ways to Save My Marriage? section. If you or your spouse are unwilling to seek help, it’s time to go. If you and your spouse try, yet are unable to reconnect, this probably signifies it’s time to go as well. What’s Wrong With Staying in “Limbo Land”? In addition to the oh-so-fun party game, Merriam Webster defines “Limbo” as a state of imprisonment or confinement. Staying in a marriage where you don’t want to be is choosing to be imprisoned. You might be doing it for a noble cause, but at what cost? Being trapped indefinitely in Limbo can kill you emotionally. And, it isn’t just harmful for you. If you’ve been thinking about leaving for a long while, are you really still emotionally invested in the relationship? Staying when you aren’t giving your full self to the relationship is very damaging to your spouse; the person you may be trying to protect. He or she feels it and the disconnection. Over time, this can lead to serious emotional issues for not only you, but your spouse. Depression, addiction, gaining weight, losing weight and affairs are just some of the potential damaging results. And lets not forget the impact your Limbo status has on your children, if you have them. As you will learn, your children are far more intuitive than you may believe. Try reframing your thoughts. Have you considered that you leaving may actually be you giving a loving gesture? You are letting go of someone so he or she can find the life he or she is meant to live, and the happiness he or she deserves. Don’t wait until you’ve hurt your spouse so deeply or you’ve become so intolerable that he or she breaks first and asks for a divorce, sparing you from having to say it first. While not your intent, that’s a cowardly and potentially cruel approach. There are many reasons people chose to stay or go. Leaving a marriage is not a decision to take lightly, and you need to look at your situation objectively and make sure your choice is for the right reasons. People are often inclined to stay for the wrong reasons. Divorce hurts! It hurts you, your spouse, your kids, your parents and others close to you. You don’t want to be the bad guy; nobody does. But, if you leave, are you actually being the bad guy or are you being courageous? Doing the right thing and the easy thing aren’t always the same. Why do people stay when they should go? … any number of very valid things! …there is also the fear of what people will think–this is also understandable, but it doesn’t mean it’s a good reason! These are all common reasons that make complete sense and may keep you stuck. But, step back and think objectively. Are these reasons really worth sacrificing your personal happiness and preventing your spouse from finding the life and love he or she deserves? There will always be a reason why it isn’t a good time. You know what they say, there is never a good time to move, get married, have a baby, start a new job or get divorced. And, the conversation will never be easier to have. Staying on the treadmill instead of moving forward is not the right answer for anyone — you, your spouse or your children. I’m Stuck. What Can I Do? A year or two from now, you want to be able to look back at your decision to divorce, or stay together, and know that you made it as an emotionally healthy person, and that it was truly a mature and thoughtful choice. You need to know you did what you could and feel in your heart that it was the best decision for all to part ways –or to stay together. Engaging in therapy can be a very beneficial process whether you go it alone, or with your spouse. A therapist you work with individually could help you understand and deal with your current issues and feelings. If you are unhappy, chances are very good there is some self-work you could be doing to help move you from the state of indecision. There is zero shame in this. It would be hard to find somebody out there who couldn’t benefit from working with a good therapist! Another option is to spend some focused time and effort toward identifying your needs and wants for yourself and your life. The means to get there is different for everyone, but the goal is to understand who you are at your core, your boundaries and vision for your life, and how that matches up with your current path. You may uncover some growth opportunities you need to work through which could be the source of some of the marital angst. You could also identify how the life you and your spouse want to be living simply isn’t following the same course anymore. Many tools exist, but we are partial to the one we created, which is in our Toolbox. The UTK Self Assessment will help you work through the important questions on your own with some tips from our Life Coach to help you make sense of your observations. 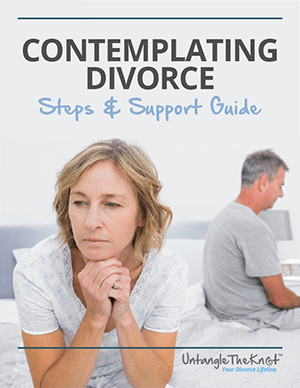 THINKING ABOUT GETTING A DIVORCE IS STRESSFUL AND CAN GET OVERWHELMING. What Are Some Ways to Save My Marriage? How Do I Know When My Marriage Is Over? How Do I Even Get Divorced? Just Thinking About Divorce Is Exhausting! How Do I Cope? LET UNTANGLE THE KNOT GUIDE YOU THROUGH YOUR NEXT STEPS.